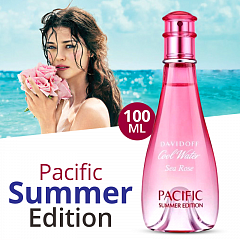 Cool Water Woman Sea Rose Pacific Summer Edition by Davidoff is a Floral Fruity fragrance for women. This is a new fragrance. Cool Water Woman Sea Rose Pacific Summer Edition was launched in 2017. The nose behind this fragrance is Aurélien Guichard. Top notes are pear and tangerine; middle note is rose; base notes are cashmeran and woody notes.